Merry Maids are the premier domestic cleaning service in the Sutton Coldfield area with extensive experience over many years. We give you a hassle-free, reliable and impeccable cleaning services designed to give you your leisure time back. Our home cleaning services in Sutton Coldfield are individually tailored to suit you, your family, your lifestyle and your home. Merry Maids of Sutton Coldfield are proud to support various charities. At the end of September, the were honoured to be invited to a very special auction for our local charity, Pathway, which supports adults and children who are experiencing domestic violence. Merry Maids of Sutton Coldfield donated a Premier Clean to the auction which we are thrilled made nearly £150 at the auction. 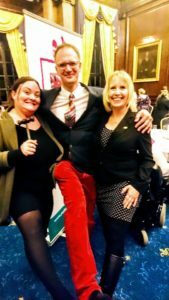 Plus Helen and Becky got to meet the whirlwind auctioneer, Charles Hanson, seen on Bargain Hunt, Antiques Road Trip and Cash in the Attic. Do you love cleaning? We are regularly recruiting. Keep an eye out for details HERE! 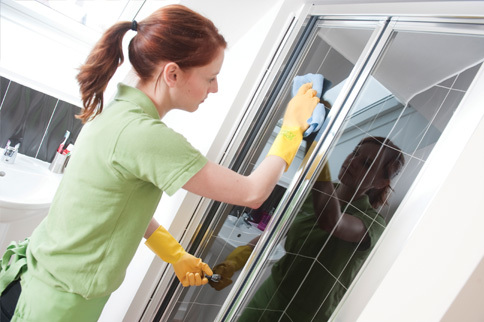 Merry Maids Sutton Coldfield are a family-run business which has been operating since 1999. In 2011 the second generation of the family, Helen, took over the running of the business from her mother Sheila. Helen Bielby and her colleague at Merry Maids, Becky Hewitt, continue to uphold the high level of cleaning offered by Merry Maids Sutton Coldfield. 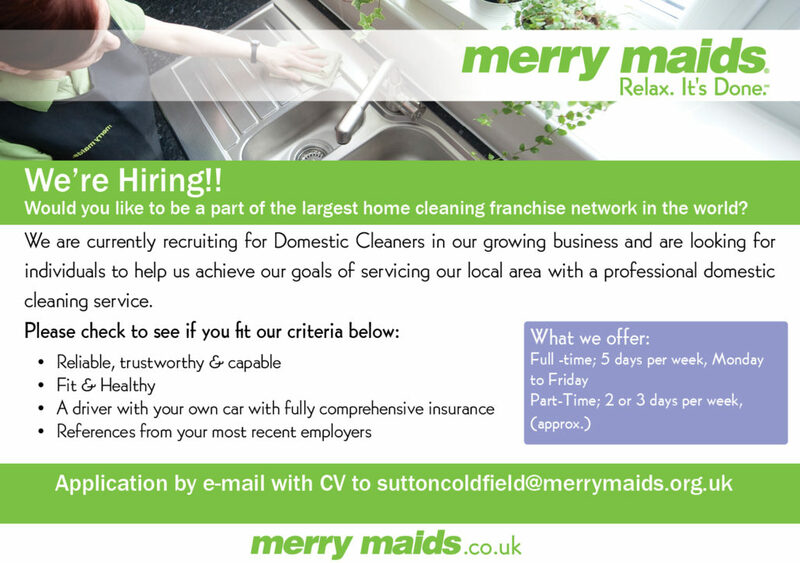 Over the past 5 years Merry Maids Sutton Coldfield has expanded significantly and now employs 12 team members. We are the most established and trusted home cleaning service in Sutton Coldfield, Lichfield, Tamworth and Walsall. Our high standards and reliability means that we are still serving customers who have used our cleaning services since Day 1! We’d love to hear about your individual cleaning requirements so that we can share with you how Merry Maids Sutton Coldfield could help with your domestic cleaning needs. Our quotation service is completely free of charge with no obligation and no ongoing contract to commit to a home cleaning service. Why choose Merry Maids Sutton Coldfield for your home cleaning requirements? Regular Checking of Cleaning. Our supervisor, Mandy, will be in touch to arrange a check of your 1st and 4th cleans, and then on a rotational basis after this. If you require you clean to be checked at any other time, let us know and we will be straight there! We offer a personalised service. The service is personalised for you and we will ensure this service is delivered. Every single customer is of the utmost importance to us and your needs are our 1st priority. We have been servicing homes in Sutton Coldfield, Lichfield, Tamworth and Walsall for 15 years. We are also part of a bigger family – ServiceMaster – who are the world-leading service for cleaning – whether that be carpet and upholstery cleaning or Merry Maids domestic cleaning. With over 700 franchises in the UK and thousands more world-wide we are part of a large organisation who are leaders in their field. We are flexible. If you need to cancel your clean because you are on holiday or not avaliable – that’s fine! Just give us 48 hours notice please. Or you can provide a key for us to keep safely and securely, ensuring that access to your home is hassle-free and your clean can always be carried out, even if you are not in. We are a fully registered business. We are stringent about who we employ and we are not an agency – all of our staff are directly employed by ourselves. Merry Maids Sutton Coldfield are your local, professional, domestic home cleaning business and have been cleaning homes in the Sutton Coldfield, Lichfield, Tamworth, Walsall and surrounding areas for 15 years. The map below shows the area which our home cleaning services cover. No-one wants to spend all their spare time cleaning their home. Thats our job! Merry Maids Sutton Coldfield home cleaning services give you back the time to concentrate on the things that you enjoy. We can carry out a regular cleaning service on a weekly, fortnightly or four weekly as required in Sutton Coldfield, Lichfield, Tamworth and Walsall. We even supply all our own specialist cleaning equipment and materials! The above list is fully adjustable so you can make it as long or as short as you wish. We build our quotation around your exacting requirements and we complete the job for the price that you pay. You don’t have to have the same cleaning tasks completed each visit, you can alter these. Just speak to a member of our team! Although it is traditionally known as a Spring Clean, Merry Maids Sutton Coldfield can deep clean your property at any time of the year. Most people are full of good intentions but lead such hectic lifestyles that other more important things always seem to crop up. …then Merry Maids Sutton Coldfield can help. Here at Merry Maids Sutton Coldfield we know that each property is as different as the people that live there so we offer a bespoke quotation service, tailoring our work to your requirements. We pride ourselves on providing a service specifically for you. Although we clean many homes, we want to tailor the cleaning you require to exactly what you want. That way your clean is affordable, professionally carried out to your specification and provides you with one less thing to worry about! On our initial quote we will take notes which will be formulated into the worksheet that the cleaning team will work from each and every time. If changes are required – easy! Just let us know via phone or email. We clean your home from top to bottom, left to right and front to back so nothing can be missed or overlooked. Each and every room is checked after cleaning to ensure it meets our very high standards. Our supervisor, Mandy, checks all cleans on a rotational basis and after the 1st and 4th cleans to ensure that you are 100% satisfied with the service prvided. Our cleaning services are thorough, consistent and customised. If you want us to skip a certain room, we do it. If you want a special service, just let us know. If you want to change your cleaning routine, simply call our office. We’ll take care of it. 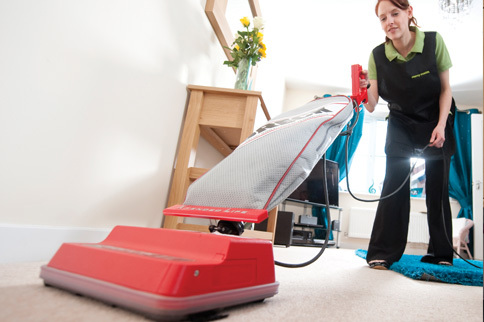 On every visit, your Merry Maids team dusts, vacuums, washes and wipes each room. Using our equipment and specially formulated products, we clean the way you want it, every time. Are you a driver with your own car and fully comprehensive insurance? Can you get to our office in Sutton Coldfield by 9 am each day Monday to Friday? Are you available until 3 pm if required Monday to Friday? Are you reliable, trustworthy and a good time keeper? Can you provide references from a recent employer? Are you a fit and energetic person as this is a physically demanding job? Can you work to the highest professional standards? If you can answer yes to all the above then please call 0121 323 4811 and speak to Helen Bielby or Becky Hewitt (Business Owners). We offer positions of 3, 4 or 5 days a week to suitable flexible candidates based on our business requirements. Every week I have a wonderful service from your team, they know how fussy I can be and make sure that everything is just how I like it. A wonderful service, its always so lovely to come home to a clean and tidy home. Thank you for the work you have undertaken on my home – it looks fantastic! I have used Merry Maids for over 15 years and they never fail my clean get it right every time. I am happy to recommend the services of Merry Maids to anybody who needs a reliable and efficient cleaning service. I love walking into my home when it has been cleaned, it smells wonderful and everything shines! I’ve tried other services but none have fulfilled my expectations until I employed Merry Maids. I met Sarah and Liza this morning and they are both lovely. I’ve just got home to a lovely clean house, I am very pleased! Please can you pass a thank you onto them both for a great job. I booked Merry Maids of Sutton Coldfield to do a one off deep clean prior to moving in to my new property after hearing such great word of mouth reviews. They certainly didn’t disappoint! The office dealt with my enquiries efficiently and were very helpful. I found the clean itself more than exceeded my expectations- plus it meant that I didn’t have to clean up after the previous occupier so saved me valuable time before my house move. I had initially booked the clean as a treat to myself, but was so pleased I shall be booking a regular monthly clean in the new year. Thankyou Merry Maids of Sutton Coldfield! Really happy with my first month of cleans from Merry Maids. I only actually intended to use them on the run up to Christmas but the girls are so thorough I’ll be continuing our booking as an ongoing arrangement. Spotless work and friendly and reliable cleaners. I can’t speak highly enough of these guys. They listened to me and cleaned to a very high level, and I am very picky. I only needed one deep clean, but I wouldn’t hesitate to go back to them. A detailed clean every time, and thoroughly trustworthy company to deal with. Thank you very much for the wonderful clean carried out a week ago. My mum took photos to show me how unbelievably clean it was! It was very, very much appreciated.